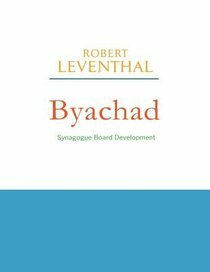 Intended to be the perfect; companion piece to Stepping Forward, Byachad is a seventy-two page workbook that every synagogue board member should have. One of the signs of a vital congregation is its leadership. This workbook is an attempt to build board consensus about critical governance functions and to create a systematic plan to motivate and support leaders in developing new practices. By focusing on shared congregational goals, leaders will provide the right direction, make the right assessments, and provide the right feedback--building enduring relationships as they do important leadership work.